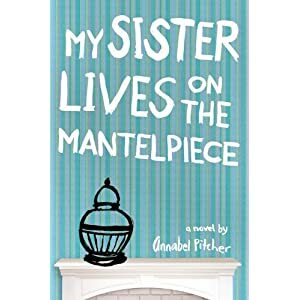 Crazy Book Reader: My Thursday Obssesion: My Sister lives on the Mantelpiece, by Annabel Pitcher. My Thursday Obssesion: My Sister lives on the Mantelpiece, by Annabel Pitcher. In 1982 she was born in a small village in West Yorkshire where there were more sheep than people. No traffic, one shop, two pubs and lots of fields to play in - perfect. She loves the country and, though She’ve enjoyed living in cities, she is definitely happiest in the middle of nowhere surrounded by hills.